Recently, I had left the garage door opened, so that I can clear the driveway and the wheelchair ramp from all the snow and ice that we received within the past few days. While I was busy outside, a couple of birds flew into the garage without me knowing it. When I was finished, I walked back into the garage, placed the shovels back into their spots, stomped my feet to clear them from sludge – mud and snow – and proceeded to close the door. Something caught my eye and I heard a few chirps. A pair of wrens found themselves in the garage and were now trying to escape. I pushed the garage door open wider and saw one bird fly out, yet the other bird flew to the far back of the garage and seemed trapped. My guess is, she was terrified and didn’t want to chance flying towards me. I started in her direction and she flew to the right, towards the only window in the garage. No exit there. I walked in her direction again, yet she just sat there, shivering. I wasn’t going to hurt her, yet she didn’t know that, poor girl. I started talking to her calmly and quietly. She had her eyes shut and seemed paralyzed with fear. I noticed a small bag of bird seed sitting not too far away and got a small handful, placed it in front of her, then left…after I quickly snapped a picture. Her mate was just outside the door, calling for her, so I knew that if I left the door open, she would find her way out. I had left the garage and went back inside the house to let my grandmother know about the bird. Thirty minutes later, grandma went to check to see if the bird was still there…she had left. 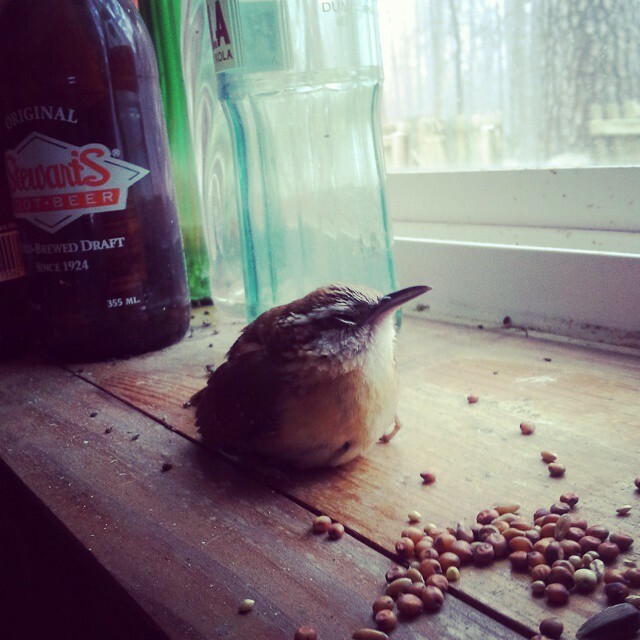 This entry was posted in Blog and tagged animals, Arkansas, Arkansas birds, Author Jennifer Adams, author Jennifer N Adams, aviary, biology, bird watching, birds, Birds of Arkansas, blog, blogging, Carolina Wren, kindness, ornithology, photography, snow, winter, Wrens on February 27, 2015 by JenniferNAdams.